People who live in lively homes or who live near a heavy traffic area might want to consider purchasing a white noise machine, which effectively blocks out all but the more noisy interruptions in sleep. 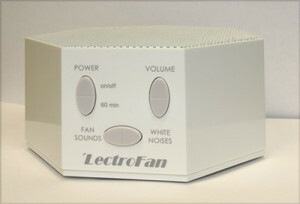 White noise machines come with various features that may or may not be helpful to you as you search for the right white noise machine for you. This is not technically a white noise machine in that it has no recorded sound. Instead it has an internal fan within the device that gives you the sound of a fan during the night. It has two fan speeds to choose from and is good for traveling. The pitch of this machine tends to be rather high so if you are looking toward getting a lower pitched white noise sound, this might not be a good choice for you. This costs around $55 and offers only two soundscapes. The first is a type of static sound, like a television going off the air. The second sound available is that of an overhead or ground-based fan. The pitch and volume can be decided and adjusted to your needs whenever you want to change it. You can set it on a timer or play it all night long. It is good for travelers in that it doesn’t take up much space in your suitcase. It can be plugged into a wall outlet or into a USB port in a computer. As long as you feel comfortable with the two soundscapes offered, it can be a good choice for you. For around a hundred dollars, this machine has a lot of great features. It can detect whether or not you are in a noisy area or when it is quiet and will adjust the volume of the sound it creates. If the room is relatively quiet, the machine will be quiet too. It has ten different soundscapes to choose from that are realistic and random in nature. The sound is randomly generated so you don’t get a feedback loop of the same predictable sound running over and over again. You can’t have this machine running all night but it gives you a wide variety of choices as to when it will gradually stop creating noise. Is it battery operated sound machine or must it be plugged in? Battery operated sound machines can be taken anywhere, even camping, and are best for travelers who want to bring their machine with them to sleep outside of the home. Most offer a dual feature, where you can plug it in or use battery power, depending on the circumstances. Does it make one sound or a variety of sounds? They make white noise machines that make only one particular sound that sounds like a television station has gone off the air or like a vacuum cleaner. The noise can be steady or fluctuate in a pattern or in random patterns, depending on the device. A good machine will offer you a wide variety of sounds to choose from. For example, you can get a white noise machine that recreates the sounds of waves crashing on a beach, of a babbling brook, of a rain storm or a gentle pitter patter of a mild rain. Some devices recreate the sound of wind on a mountaintop. Everyone differs in what sounds they like so having a choice of sounds is a plus. Once you decide on a sound, however, you should stick with the same sound every night. Your brain becomes used to the sound and uses it as a signal to fall asleep and the other sounds offered by the machine become a foreign distraction. You’ll need to try out the different sounds before selecting one that feels right for you. Does the white noise machine shut itself off? 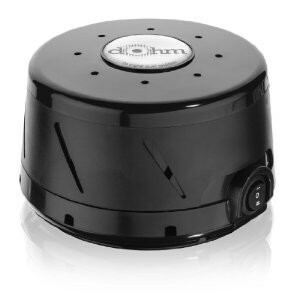 Some people need to hear the white noise machine all night long in order to get a restful sleep, while others only need to listen to the machine while falling asleep and don’t need it later on while they are sleeping. A good white noise machine has different settings so you can keep it on for 30, 60, or 90 minutes as well as a “continuous” feature. The setting you choose depends on how long it takes you to fall asleep. Nothing is more aggravating than having to get up and restart a machine that has shut off in the middle of your restless attempt at sleep. Does the machine shut off all at once or gradually? Some machines play for a period of time and then the machine just shuts off. This may not be bothersome to some people but the abrupt change in white noise to no noise can actually wake you up. You might have to turn the machine back on just to get a good night’s sleep. White noise machines that gradually fade away over a period of several minutes tend to be better because your brain gradually lets go of the sound and you have a greater chance of staying asleep when the last few notes fade away. 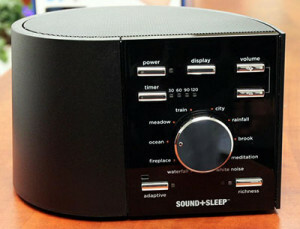 Is the white noise machine cheap or expensive? Generally, you get what you pay for in a sound machine. The more expensive machines will have more soundscapes and will offer other choices in how long the machine will stay on than cheaper models.